All of my friends and family have been known to do it. [(ta1) (men.)] (hui4) (mai3) (qiao3 ke4 li4) (gei3) (wo3). 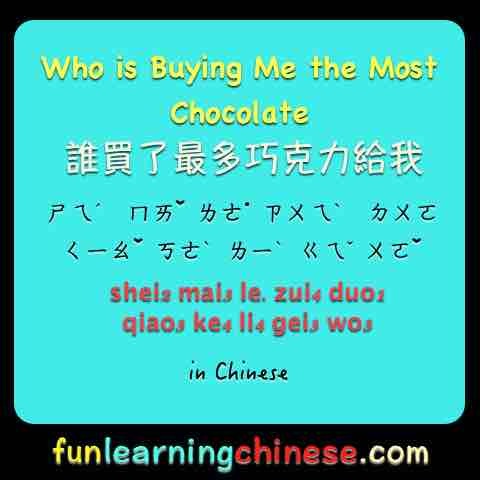 [(he, but also gender neutral pronoun for a mixed group when you need to add the suffix that makes it plural) (suffix that makes the first word plural)] (will) (to buy) (chocolate) (to give) (me). They buy chocolate to give me. Some do it more than others. [(wo3) (de.)] (xian1 sheng1) (mai3) (bi3) [(wo3) (de.)] [(hai2 zi.) (men.)] [(geng4) (duo1) (de)] (qiao3 ke4 li4) (gei3) (wo3). [(I) (suffix making it an adjective, and thereby possessive) = my] (first/foremost to live = husband) (to buy) (to compare to) [(I) (suffix making it an adjective, and thereby possessive) = my] [(child) (plural marker)] [(still more) (more) (suffix indicating this is a descriptor for the following word)] (chocolate) (to give) (me). My husband buys more chocolate to give to me than my children do. (ta1) (you3) (bi3) (hai2 zi.) (geng4 duo1) (qian2). (he) (to have) (compare to) (children) (even more) (money). He has comparatively more money than the children. (ta1) [(mei3) (nian2)] [(mai3) (le.)] [(hen3) (duo1)] (qiao3 ke4 li4) (gei3) (wo3), (ke3 shi4) (jin1 nian2) (ta1) (gei3) (wo3) [(geng4) (duo1)] (qiao3 ke4 li4). (he) [(every/each) (year)] [(to buy) (emphasizes completed action)] [(very) (much)] (chocolate) (to give) (me), (but) (present year) (he) (to give) (me) [(still more) (much)] (chocolate). He gives me a lot of chocolate every year, but this year he has given me even more. He just casually carries in a bag. (wo3) [(shi4 shi4) (kan4)] (he2 zuo4). (I) [(to try to try) (see)] (to cooperate). I try to see what I can do to cooperate. he never calls me names. He only teases a little. (ke3 neng2) (wo3) (hui4) (gao4 su4) (ta1), [(jin1 nian2) (ni3) (shi4 shi4 kan4) [(geng4) (chang2)] (yong4) (guang1 jiao3 ya1) (pao3 pao3 kan4). (possibly) (I) (will) (to tell) (him), “(present year) (you) (try and see) [(more) (often)] (use) (bare feet) (run and see what it is like). (ta1) (hui4) (you3) (geng4 duo1) (qian2) (ma.) ?! (bu2 guo4) (wo3) (zhen1 de.) (bu2 yong4) (geng4 duo1) (qiao3 ke4 li4) (le.). (he) (will) (have) (even more) (money) (question particle)?! (however) (I) (really) (not use/need) (more) (chocolate) (adds sense of finality). He will have even more money?! However, I really don’t need more chocolate. (wo3) (bu2 hui4) (xian2) (you3) (tai4 duo1) (qiao3 ke4 li4)! (I) (not will) (to complain) (to have) (too much) (chocolate)! I won’t to complain that I have too much chocolate! ❸ The 們 (men.) is optional in this case, because 孩子 (hai2 zi.) is used as both singular and plural. 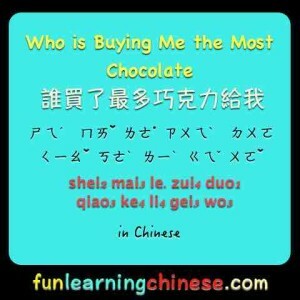 ❺ In the Chinese language, the doubling of the same word is used to both add rhythm and to soften the meaning, making it less direct and less stern sounding. 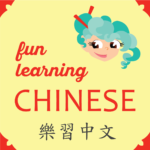 The Chinese word 看 (kan4), its most common meaning being “to see,” can be added to almost any verb to suggest that something be “tried to see what it is like.” The doubling of the verb it is attached to makes this more friendly. ❻ Adding a 吧 (ba。) on the end of the sentence makes it even more clear that whatever is being said is being offered as a suggestion. ❼ For the Chinese, scolding is taken very seriously and implies derision, not just necessary correction like it sometimes means in English.